As the bubble solution it is the most important "tool" for to blow bubbles, I will talk shortly about it in this chapter, however I will not discuss or describe here any formula as there are a lot of web pages and social sites where it is possible to find the "best" solution. As the aim of the whole site it is to research the history of bubbles as a performing art, I will discuss here mainly the evolution of bubble liquid during the years. 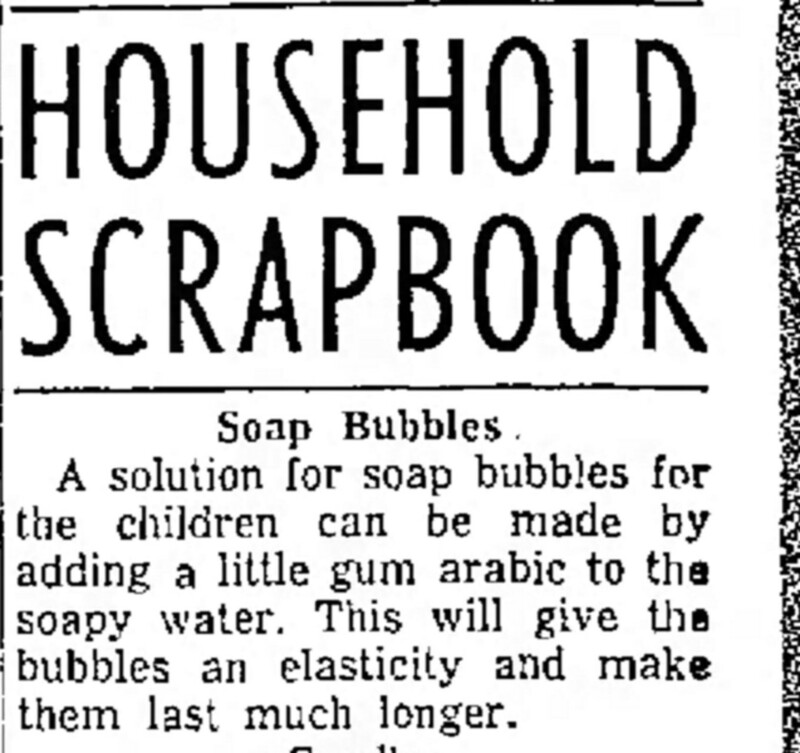 If we exclude the fact that, perhaps, the first "formula" was just plain water with some soap mixed in, the first technical bubble solution started to appear in Scientific volumes like "Soap Bubbles" of C.V. Boys and other volumes and articles about amusing science from 1880. 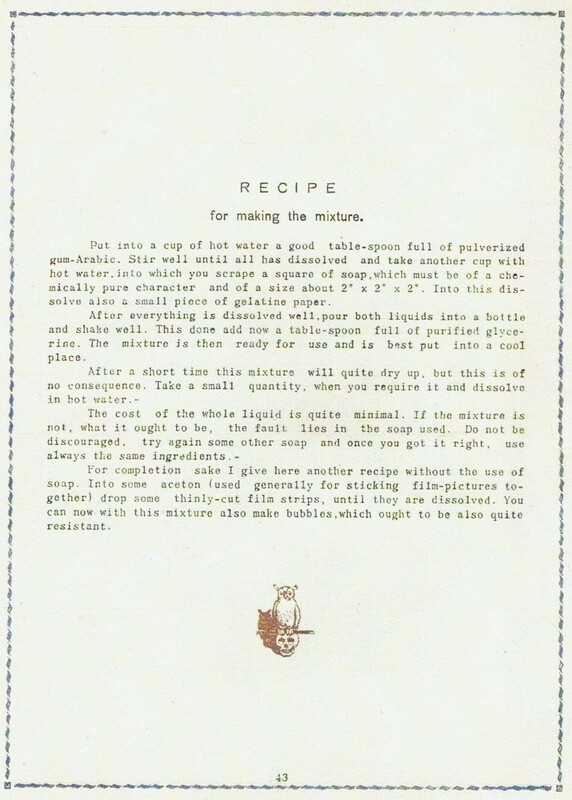 The majority of formula included ingredients as Castile soap, water (many suggested to use water from rain for to have less impurity, this say a lot of how lower was the pollution at that time or how bad was the drinking water...) and,sometime, glycerin or sugar as additive for to improve the strength. This kind of solution was very popular and still used until modern days. Some more technical formula (mainly for scientific use) included the use of product as Sodium Oleate (a product at the base of many soap at the time) or Colophone, making it very difficult to produce at home, for this reason the above formula stick for many years for general use. I found a very interesting formula in a small booklet for magician, produced in the 1928 from known German magician and prop builder Conradi. The booklet, except a first part dedicated to magic tricks for magician, include a supplement by H.W. Tagrey (Walter Sperling) titled "Soap - Bubbles". In the first part are explained 2 formula (check the picture below) the first one introduce the use of the Arabic Gum, which it is a novelty, as the majority of formula of the period do not make use of it, and a piece of gelatin paper. This is quite interesting, because for the first time we can see the use of an element that increase the elasticity (the Arabic gum) and another that make use of cellulose derivative (the gelatin paper), a kind of precursor of formula used today. The second formula it is also quite interesting because it is soapless: it make use only of Acetone in which are dissolved small strip of film-pictures. I think that the Film strips used at that time was filled with colloids and Cellulose derivative, this make sense for to obtain a liquid that can produce bubbles. 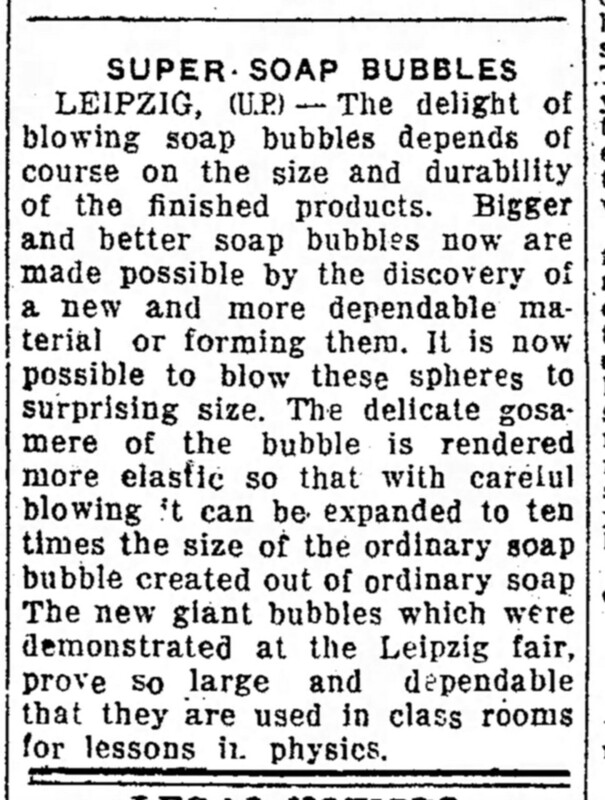 Although in the 1934 we can read that at the Leipzig fare was introduced a "Super" solution, for to blow bigger bubbles, it is only after the II WW that we start to find more articles related to other "super" bubble solution, with some new or updated ingredient inside; Eiffel Plasterer also tell about his secret formula that help him to make bubbles that can last for a year and over. 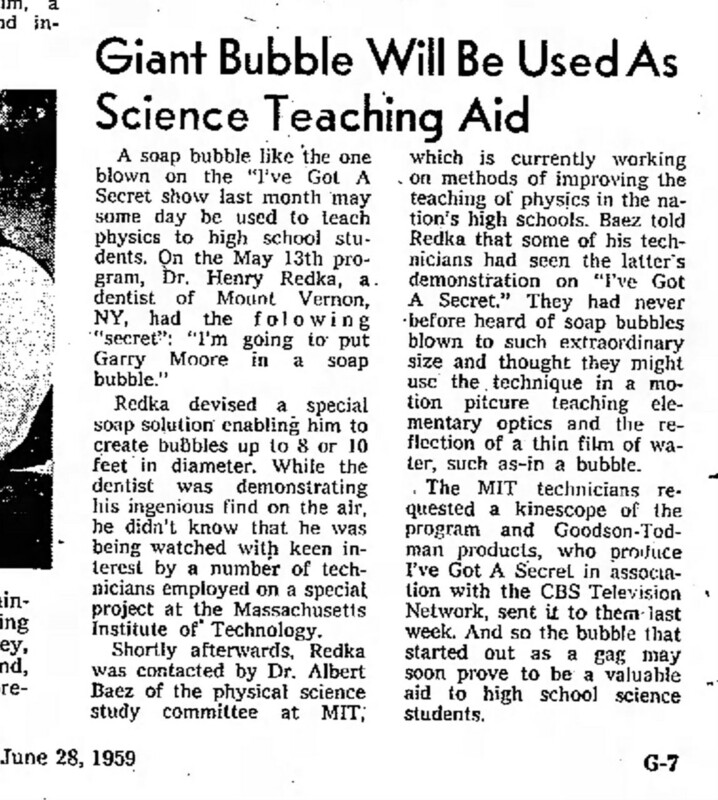 Later in 1959, Henry Redka, a dentist, declare that he made an improved bubble solution with which he can blow bubbles even 10 feet (3 meter +/-) in diameter ! Another scientist, A.V. 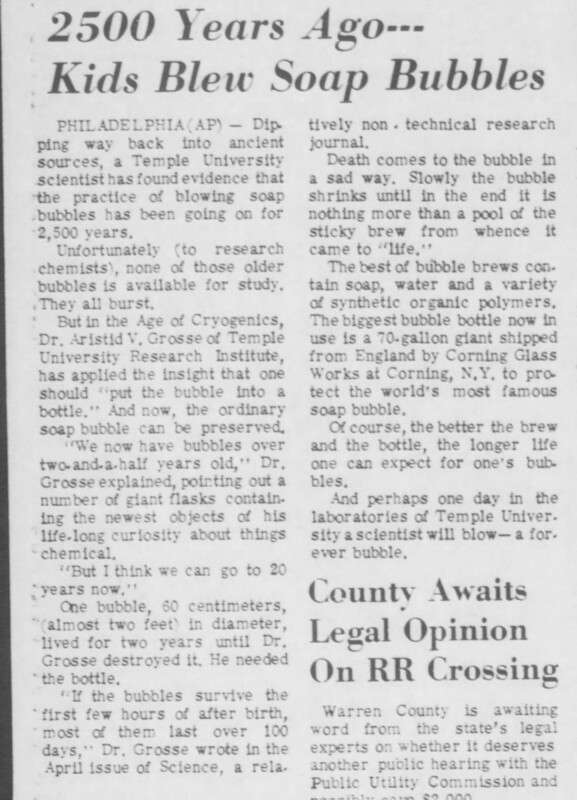 Grosse, in the '60, declare in one article that he created a new formula for to make very strong and elastic soap bubbles and this article it is the first, to my record, where it is possible to read that different polymer are added to the solution for to make the bubbles more resistant (1969). The advent of modern dish washing soap, from the '70, and the biggest and biggest popularity of polymers a bit later, started to make the life of bubble performers easier, until the explosion on the web of bubble recipe combination, few years ago, that, to my opinion, contribute mainly to create bigger confusion, especially for beginners. Below some articles from which you may read interesting information about this topic.